Space scientists urged Europe Wednesday to rethink its withdrawal from a futuristic, international dry-run for an Armageddon-like mission to deflect a space rock on a calamitous collision course with Earth. 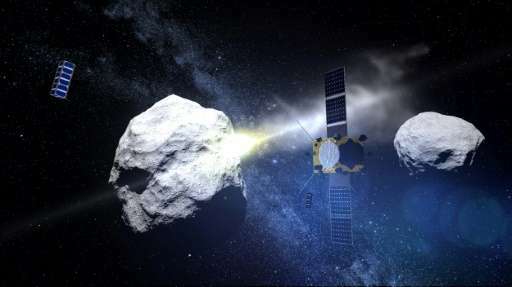 Dubbed AIDA (Asteroid Impact & Deflection Assessment), the test mission is crucial if we are to develop the capacity to protect our planet from incoming projectiles, they said. "This is the kind of disaster that could be a tremendous catastrophe," Andrew Cheng from Johns Hopkins University's Applied Physics Laboratory told AFP at a European Planetary Science Congress in Riga. He is the project scientist for the American part of the AIDA mission, named Double Asteroid Redirection Test (DART), which has entered Phase B—meaning it has been approved but still needs final confirmation. DART will entail smashing a spacecraft into the tiny moon of a faraway asteroid dubbed Didymos to alter its trajectory—a scientific first. Europe's contribution, to send a small craft close to the action to measure the crash and its impact, suffered a setback when space ministers rejected a 250-million-euro ($300-million) funding request last December. The project was called AIM, for Asteroid Impact Mission. Unlike most other natural hazards, an asteroid strike "is something that the world is able to defend. We can do something," stressed Cheng. But the methods must be tested and refined with real-life practice runs to prepare for "if we actually have to deflect an asteroid some day." "We have not discovered any asteroid that is actually coming to Earth," said Cheng, but "we may still discover one" among the thousands of hazardous space rocks believed to be out there. An asteroid that exploded in the atmosphere over Siberia in 2013 injured some 1,600 people. Didymos's moon Didymoon, the target of the AIDA mission, falls in an even more dangerous size range. It is about 160 metres (525 feet) wide, the size of an object that would hit Earth with the equivalent force of 400 megatonnes of TNT, "more than the largest hydrogen bomb," said Cheng. At the meeting in the Latvian capital, European scientists proposed an altered, slightly cheaper alternative for AIM. With a camera and miniaturised satellite, the new AIM will have a much reduced payload—minus a lander and radars to probe the moon's internal structure. The new price tag? About 210 million euros, said Patrick Michel, the science lead for the European part of the project. And of course there will be a delay. "The main point of the mission was to measure the mass of the object, because this is how you really measure the deflection," said Michel. In its new form, AIM could still do these crucial measurements even if NASA sticks to its own timeline and hits Didymoon in 2022. "Two or three years (after impact), these things won't change," said Michel. "Of course it's better... that we have the two at the same time. But we found something I think that still works and allows to relax the very tight schedule." European Space Agency boss Jan Woerner told AFP "we will go forward with a new proposal" for the next ministerial meeting in 2019. "It is important for humanity, as a species we have the means today to deflect an asteroid. We know it will happen, one day sooner or later. It's not a question of if, but when," he said by email. "We have never tested asteroid deflection and there is no way we can test in (the) laboratory. We need to know if our models are correct, (whether) our simulations work as expected." Scientists from both sides of the Atlantic urged European congress participants to sell the project to their national representatives. "There are measurements that AIM can make that DART cannot," said Cheng. "We all together have to convince the national delegations to spend some money for this mission," added ESA's Michael Kueppers. Apophis is coming in 2029 and 2036. The people were warned by Billy Meier. And did they listen?